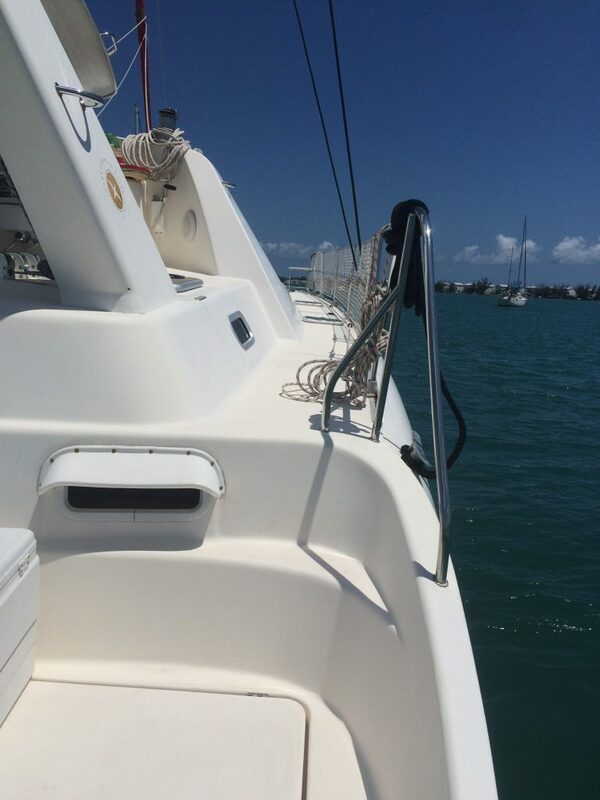 Since the first week of January, Lindsay and I have been busy deep cleaning, repairing and replacing parts on Makara in Key West, Florida. 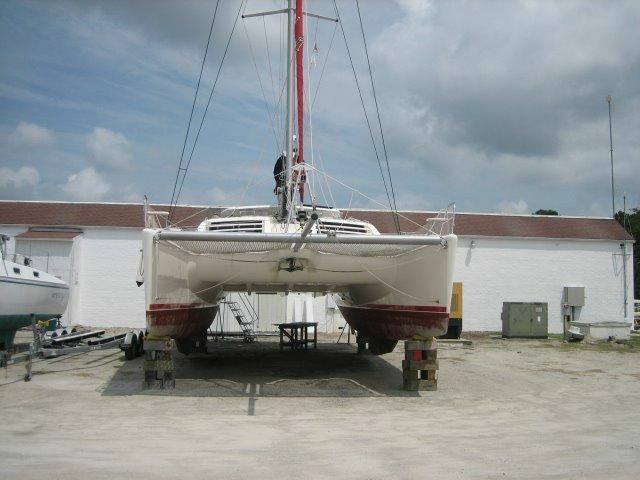 Before we purchased her, she spent many months alone and in a boatyard. Not only did the hatch seals leak, but most of the bolt holes did, too! Thankfully, most of the rigging and the trampolines are fine. 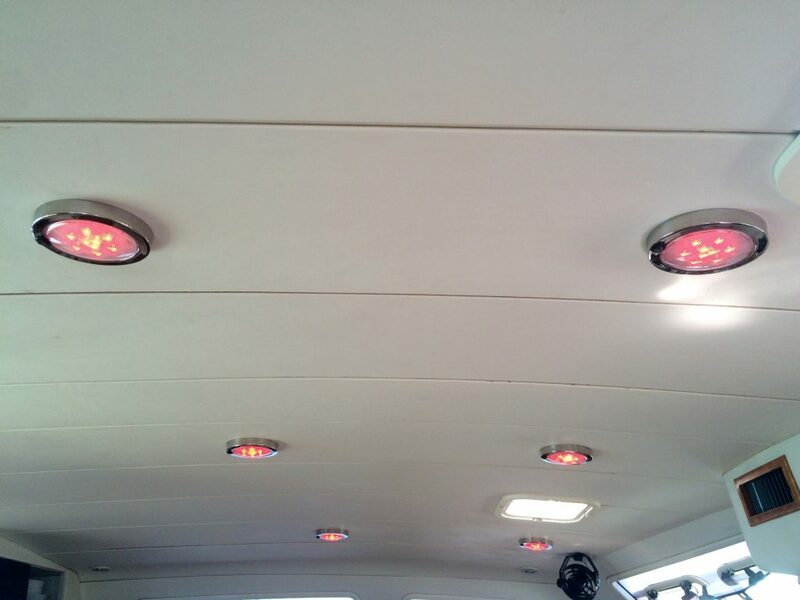 Before we could live safely aboard, we needed to address the many leaks from rainwater that soaked the mattresses, the 12 volt electrical system that started small fires when fiddling with the wires and the mold that was growing under the ceiling panels. It took days to tidy this up after the small fire. 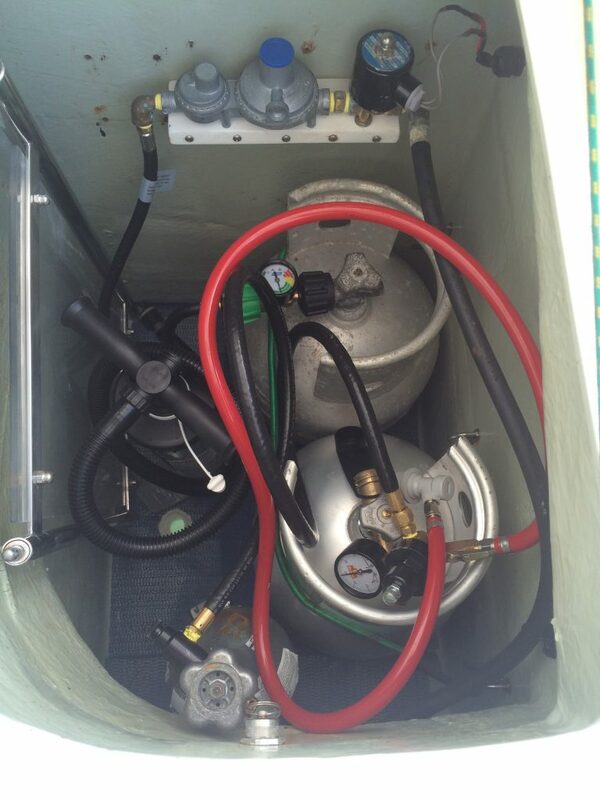 LP Gas locker with custom valve and shut off bracket, also CO2 carbonizing system is in there for beer and water. So we rolled up our sleeves and got to work. We had one cabin the didn’t leak too badly for sleeping so we moved in there and started pulling down the ceilings and checking for the location of the rainwater leaks. 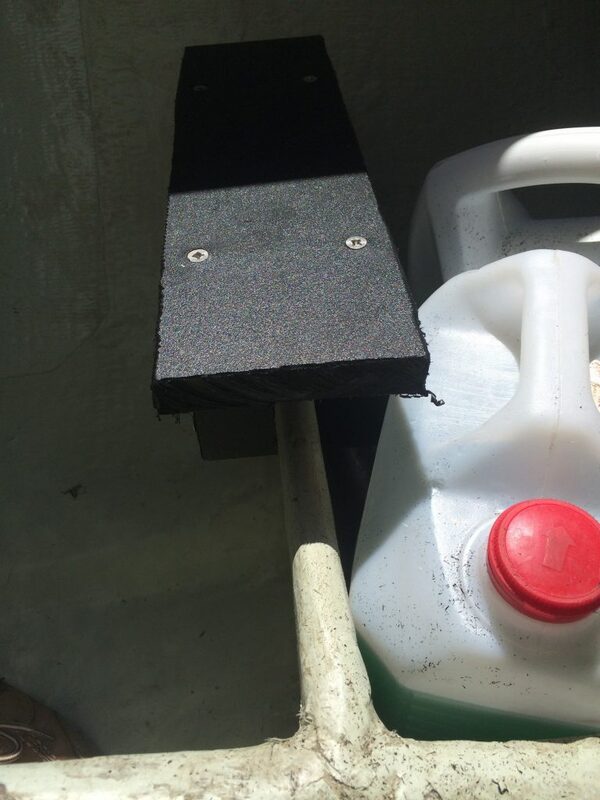 New butyl rubber sealant above the instrument panel stopped a leak into our cabin. Almost everything you see here was removed, cleaned and resealed. All four of the manual toilets were so hard to pump Lindsay got a callus on her hand so we decided to upgrade to electric ones. 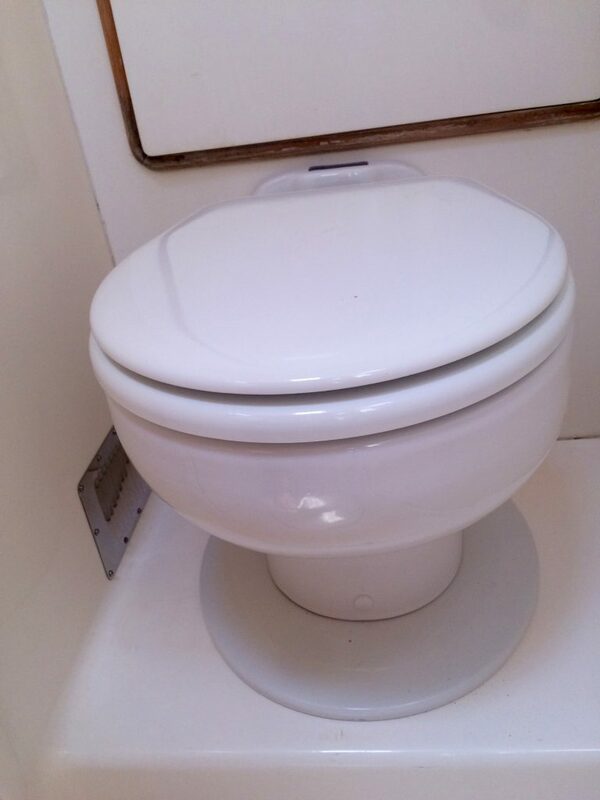 Holes in the floor from the old toilet were hidden by reusing the old seat as a base. 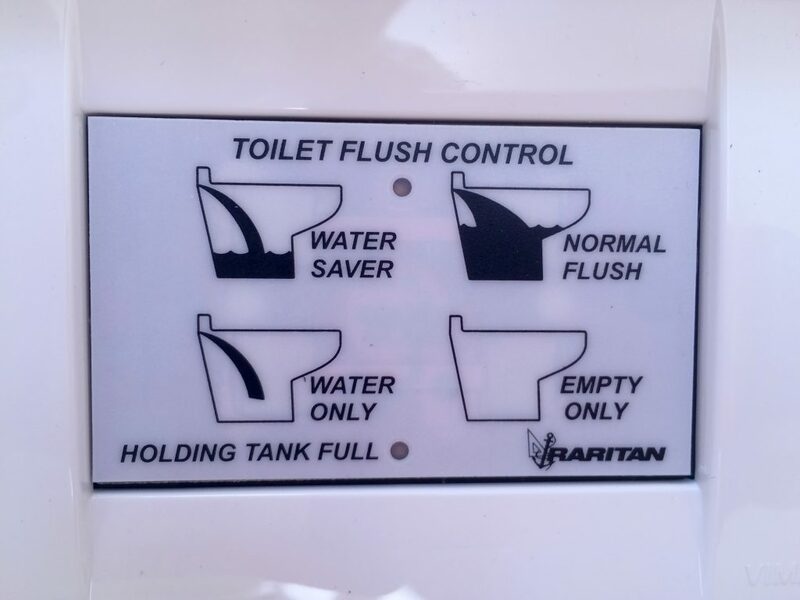 Push button controls = no more pumping! 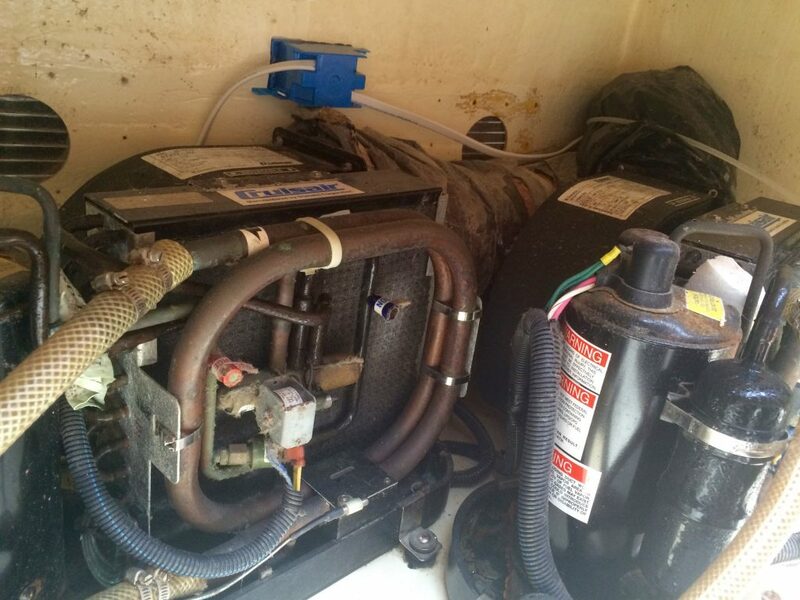 The pressurized water system was leaking and a rusty reservoir tank was about to burst. I started a list and then sorted them out by priority. 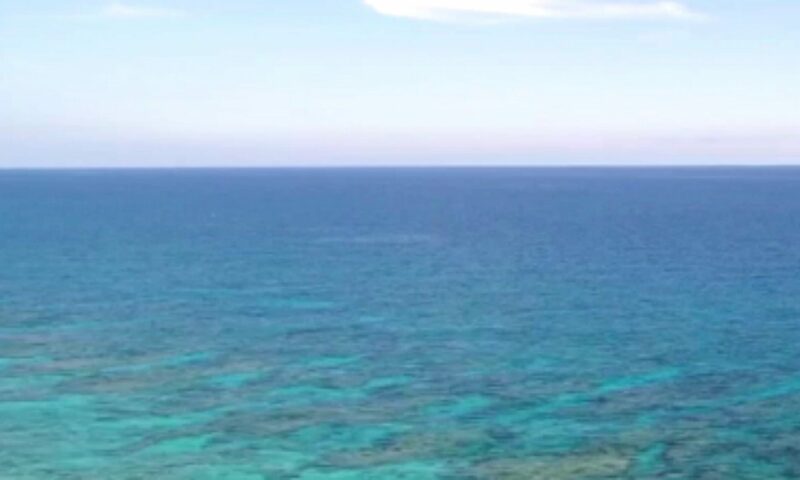 New items were discovered daily and when to the top of the “A” list. 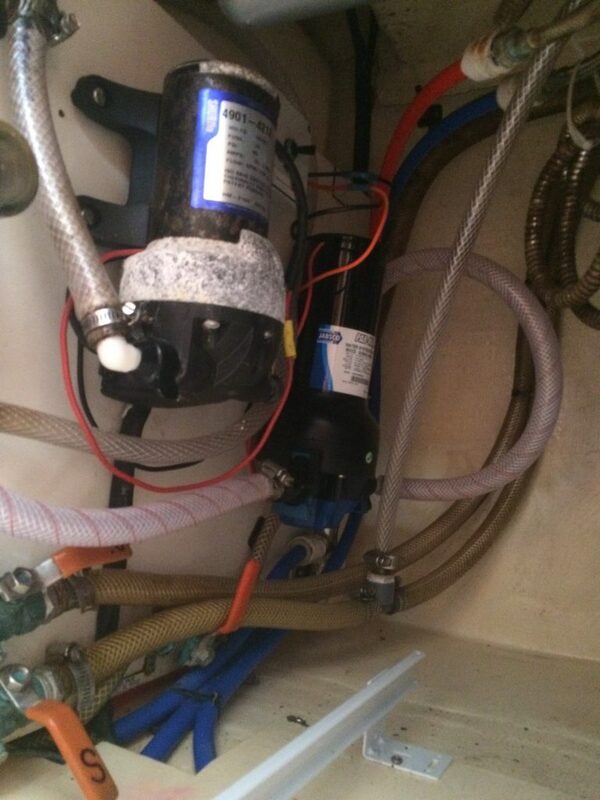 Just when one leak was found and fixed, a new one would appear. For the first few weeks, the list became longer and longer. Things that I thought were a priority “A” got shifted all the way down to “C”. 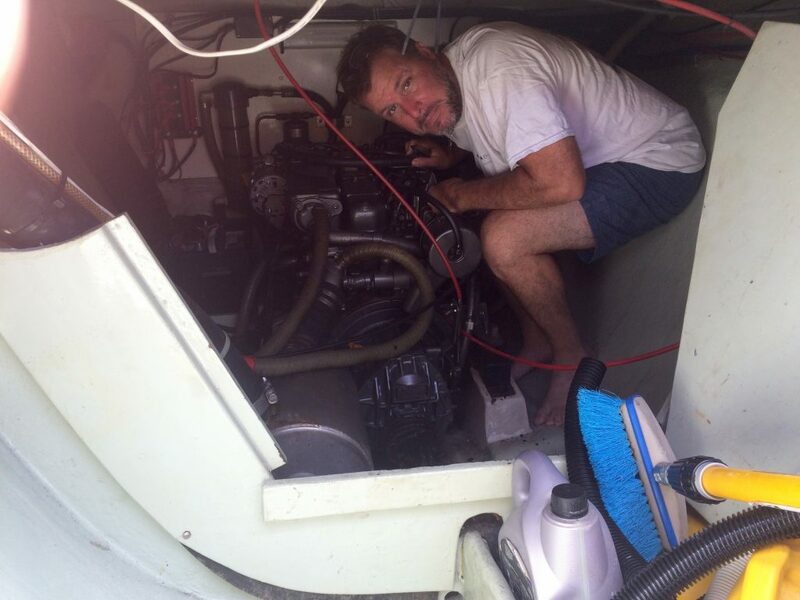 I did take the time to make climbing into and out of the engine room more comfy by making steps for my bare feet. Not really an “A” list item. 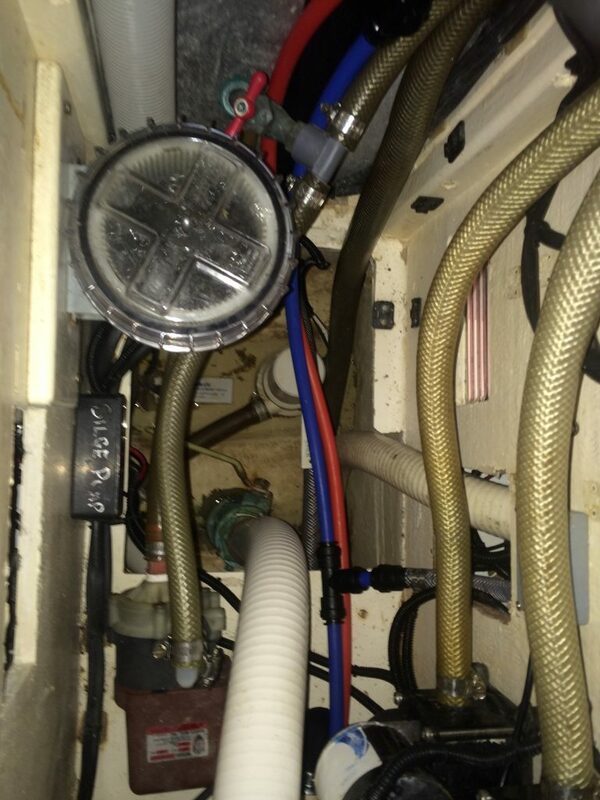 I’m still trying to adjust the refrigeration system and adding circulation fans. One big experiment that never ends. We started the long process of sourcing strange new parts and ordering them from the least expensive place. Amazon boxes came piling into our friend’s house in town. 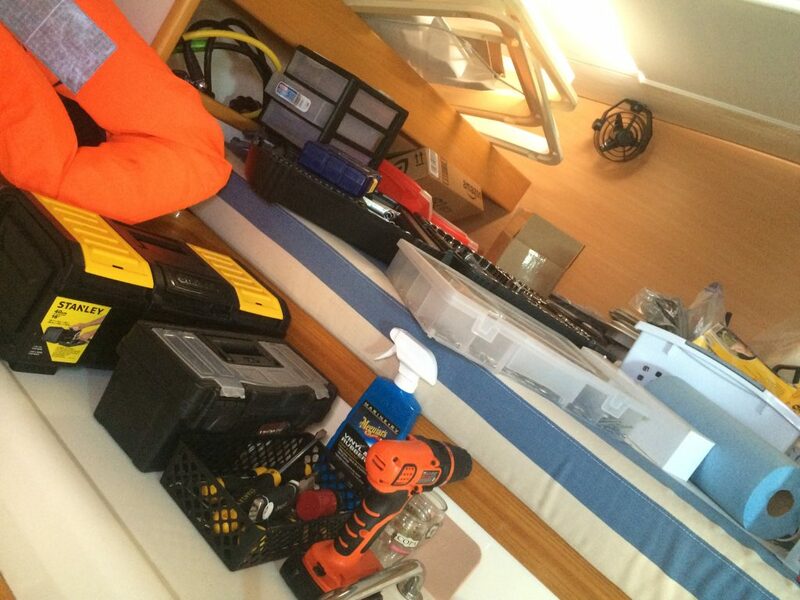 We had mountains of boxes in our dinghy every few days, bouncing out to the mooring field. A big pile of recycling loomed in the cockpit at all times. 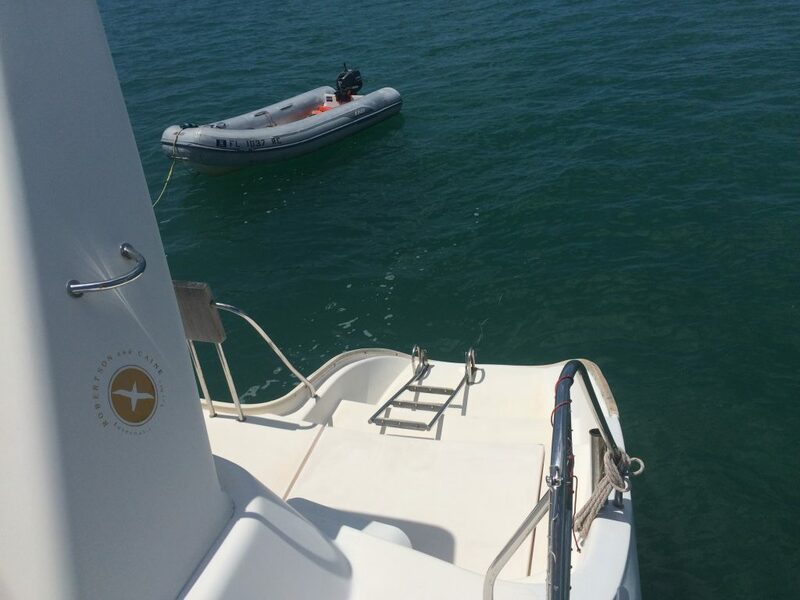 It’s a 10-15 minute dinghy ride to the dock. 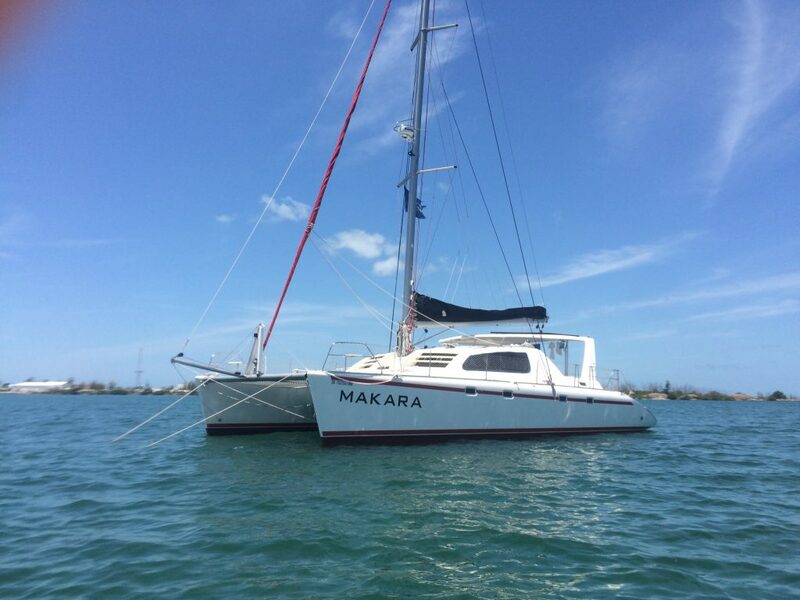 Makara resting in the city mooring field. The field is full, but neighbors are not too close. 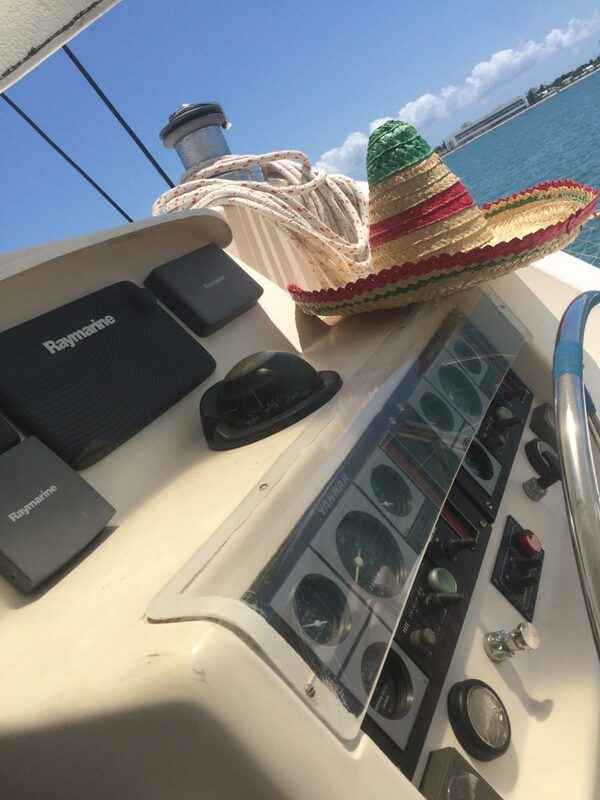 To date, we have been on board and working for 8 weeks since the first of the year. During that time, I have checked off 134 items that total approximately 319 man hours, averaging 35 hours of labor per week. The two engine rooms are a bit tight. 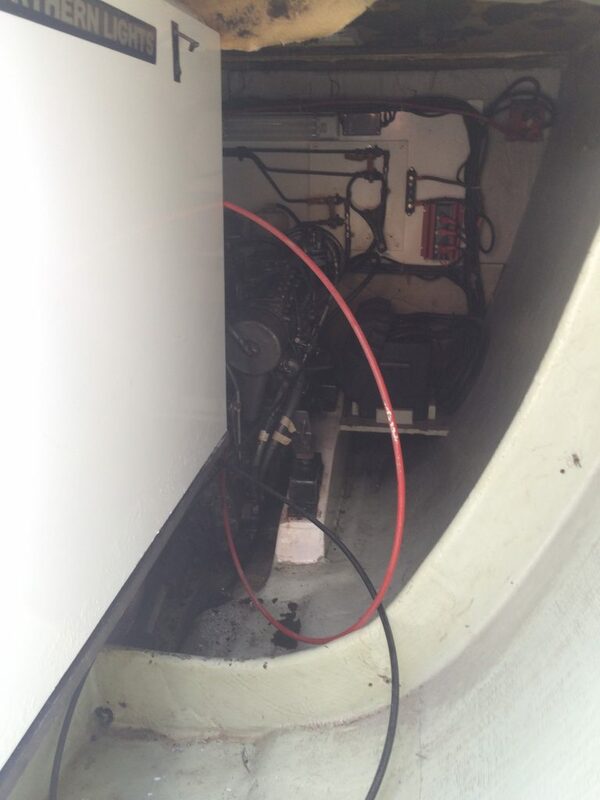 Especially with a 9kW diesel generator stuck in there! 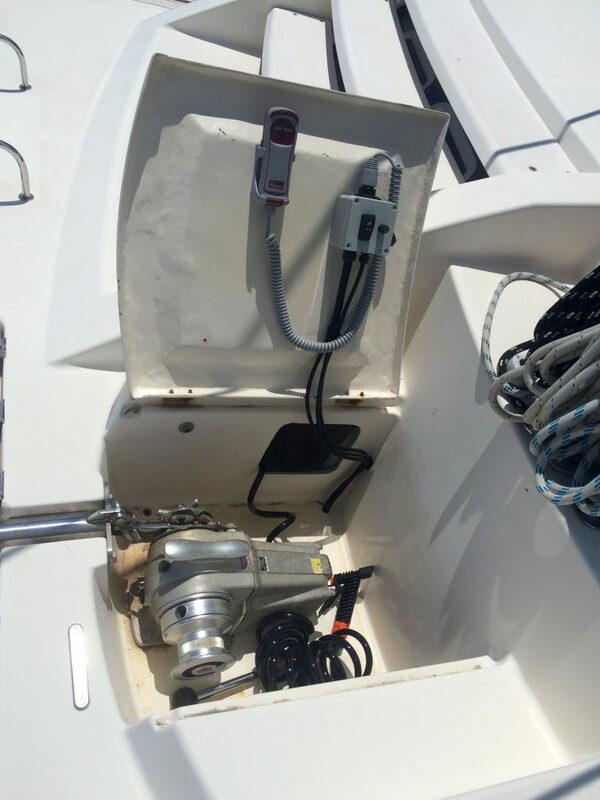 The rest of the time was spent researching parts, bicycling to the marine hardware stores and reading how-to sites. The evenings were spent whining about my sore back and applying band-aids to my hands. 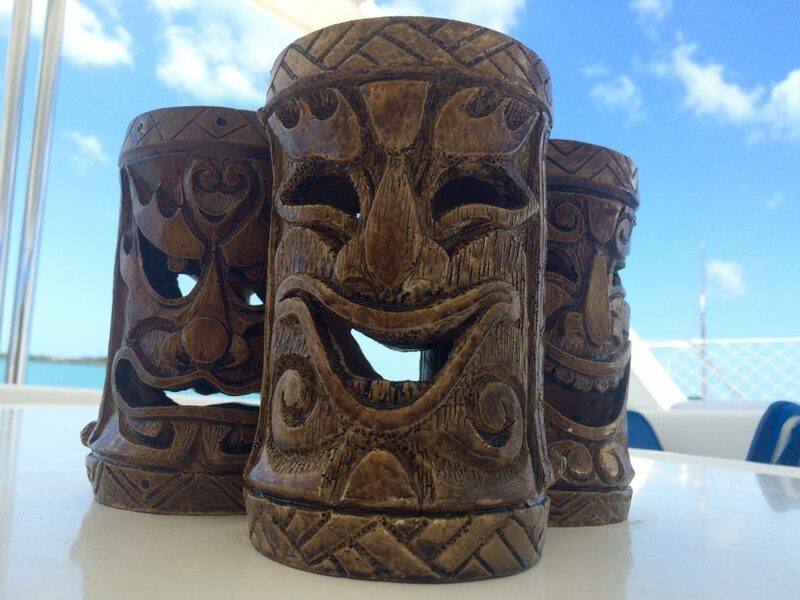 Well, there have been several happy hours on shore, but I’m not posting about that right now. 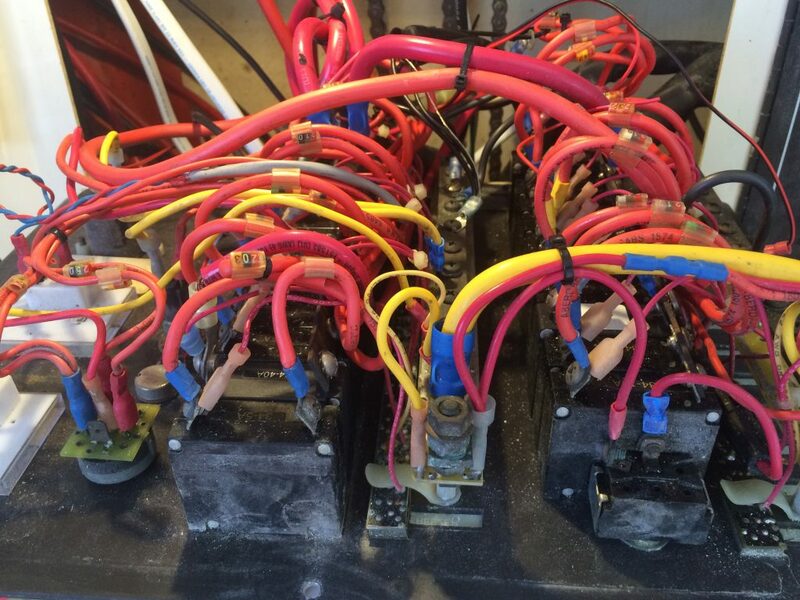 The mechanical room located between the heads has many filters, hoses, pumps, junction boxes and wiring to keep me busy. 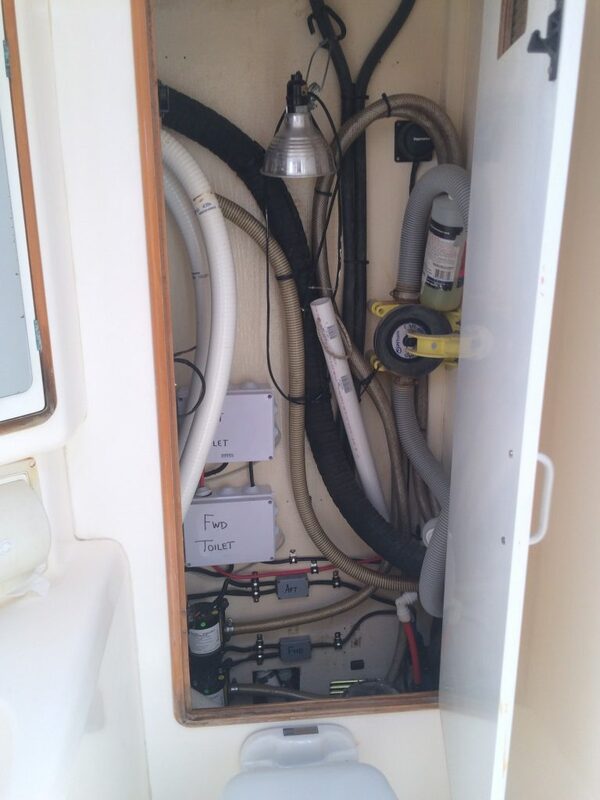 After relocating the new pumps and untangling the mess of hoses and wires, I can now see all the way down to the bilge! Unfortunately, because everything is new to me, I’ve had to redo most of my work about three times before I get it right. It’s frustrating to put something all together before realizing it doesn’t work like I thought it would. At my lowest point I threatened to Lindsay that this is the last boat I’m fixing up. I don’t think that’s true today. 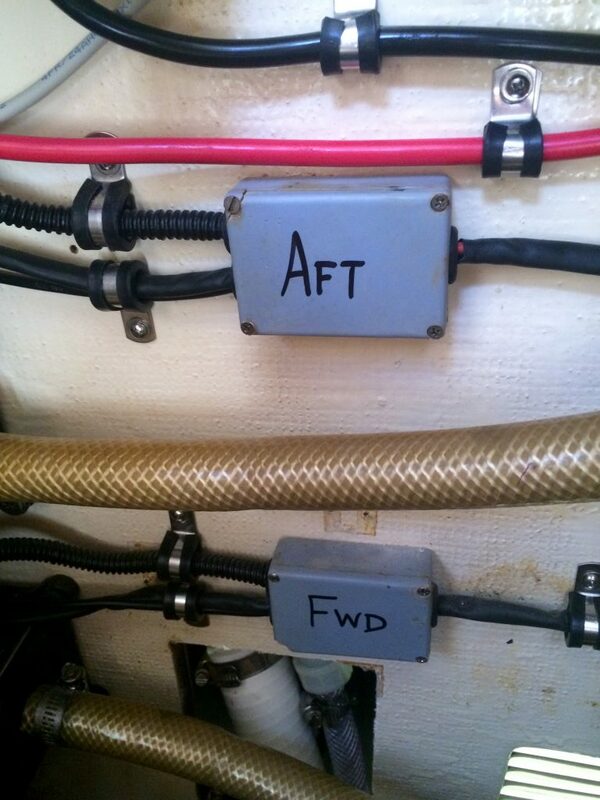 I had to enlarge a standard cover plates with the roto-zip for the four shower bilge pump switches so I could hide the old holes. Waterproof boxes house the toilet control boards. Thanks Amazon. 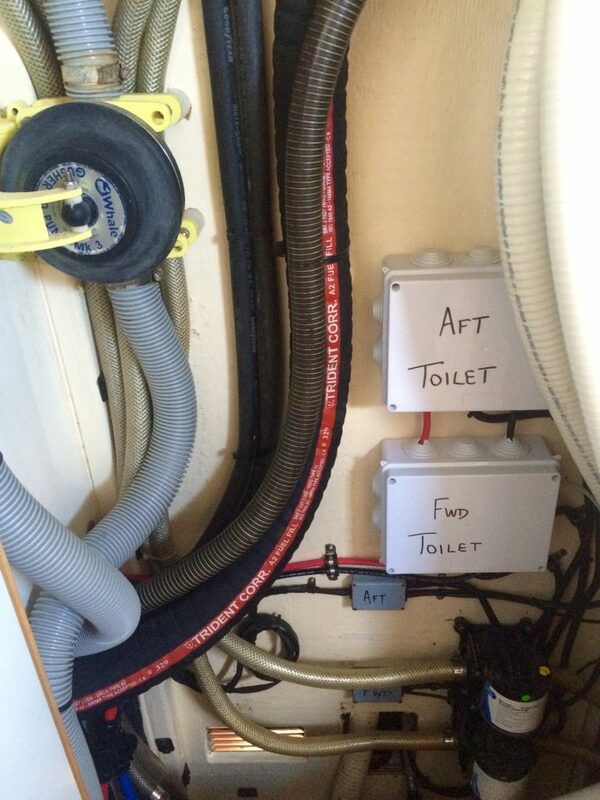 Some of my best work on the shower bilge pump junction boxes. One of the bedrooms was always a tool shed. 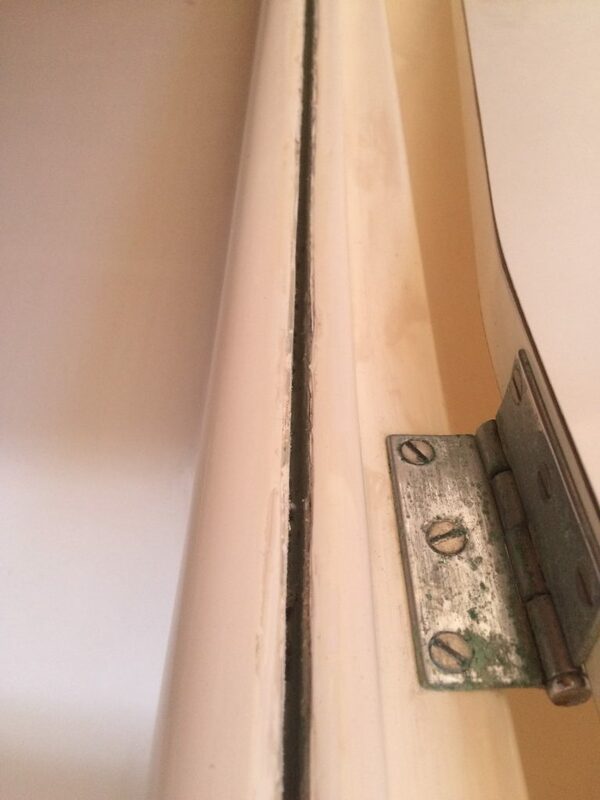 Lindsay has spend much of her time scrubbing and experimenting with toxic chemicals used in various combinations to remove mold, mildew, rust, mysterious stains and old caulk. 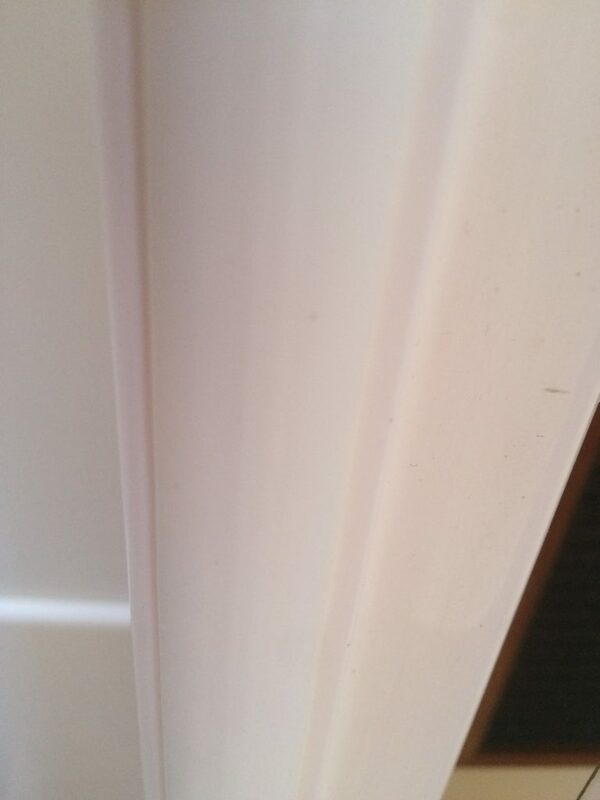 This vinyl trim in the door jambs has got to go! 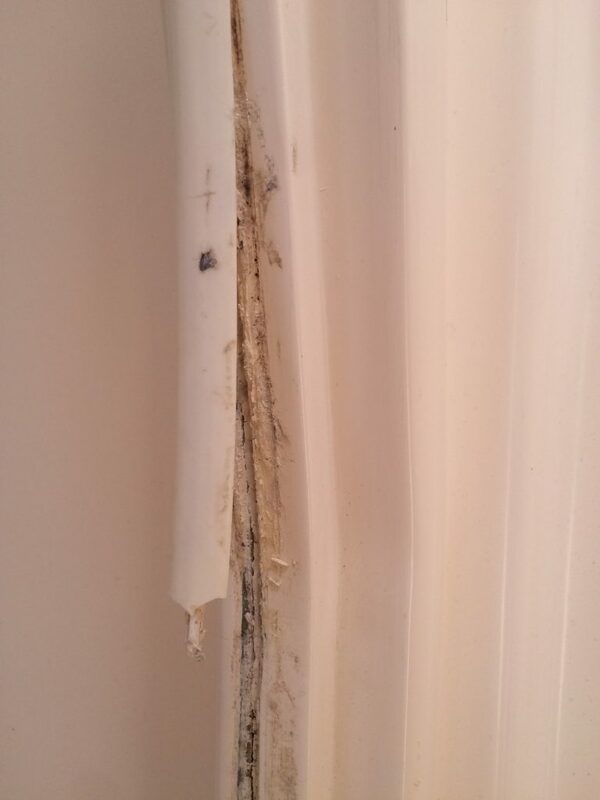 Why did someone try to fix it with sticky goop? Sticky goop removed, hours later thanks to Lindsay, a utility knife and lots of volatile organic compounds. 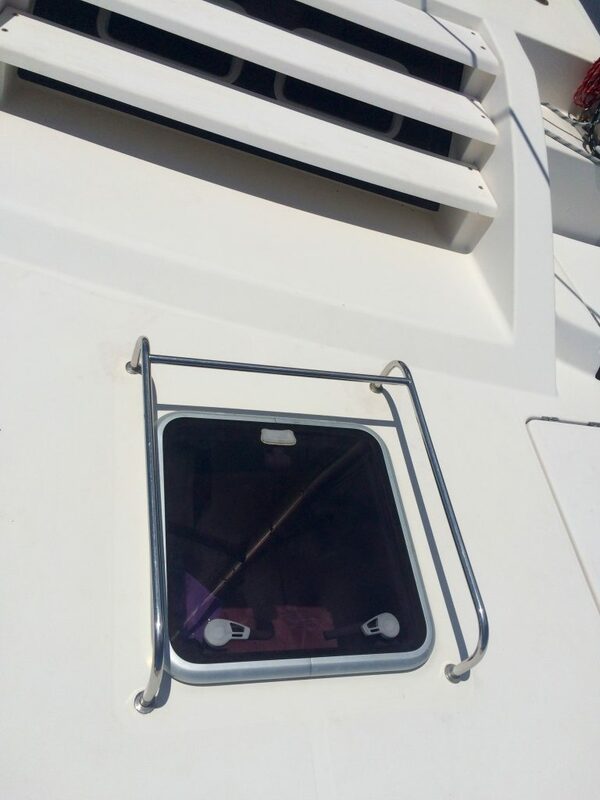 We will never take properly installed vinyl trim for granted again. She has single handedly removed headliners from the cabins and scrubbed the ceilings free of anything that lives. The place smells so much better now and white walls and ceilings are now very white. It’s difficult to show her work with pictures but I’m sure you can relate. When somethings not clean, it’s not pretty. 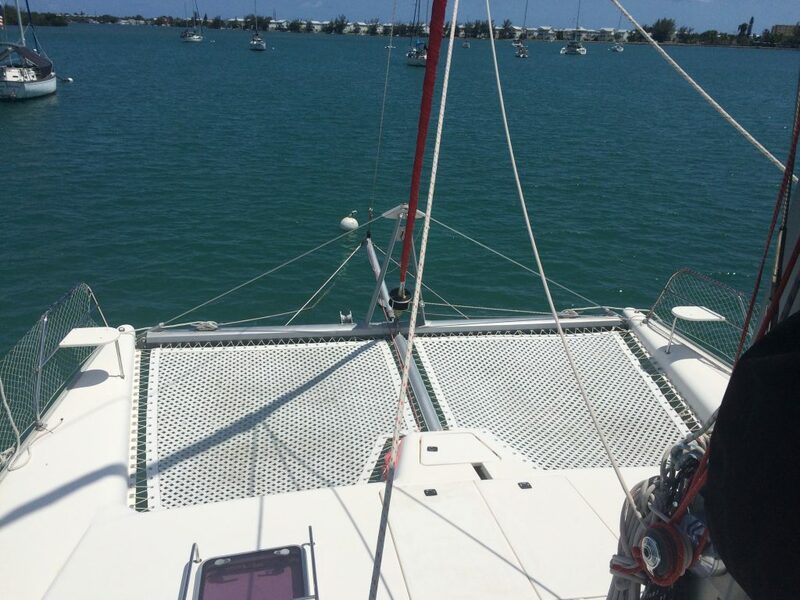 Cleaning a boat is not easy. 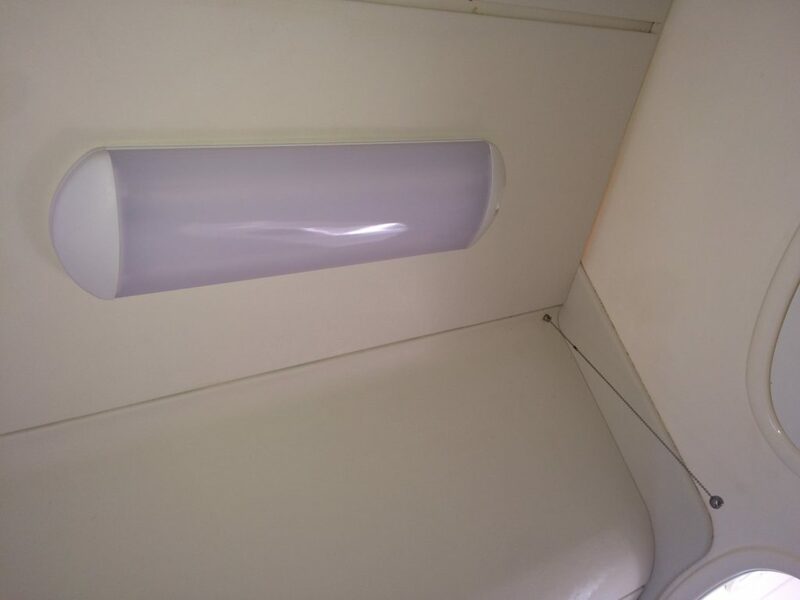 I installed new light fixtures in each cabin. 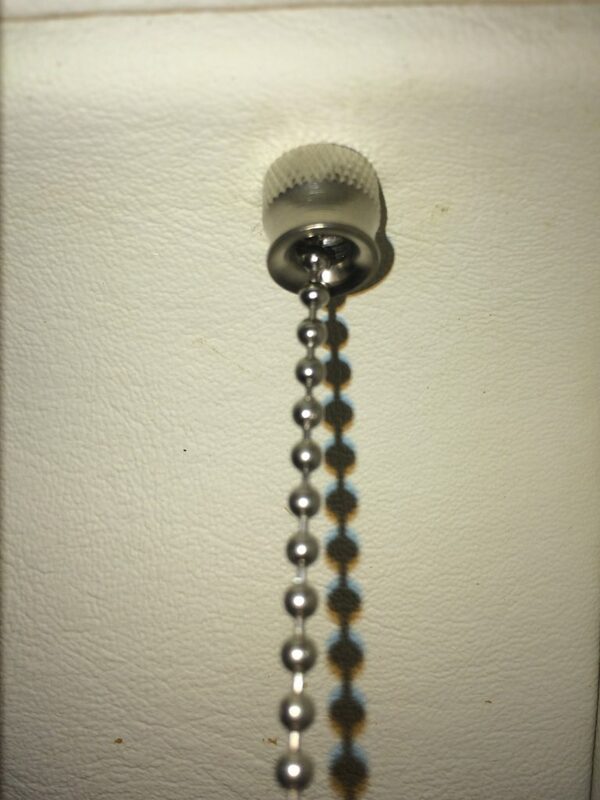 And retrofit a ceiling fan pull chain switch near the door for convenience. 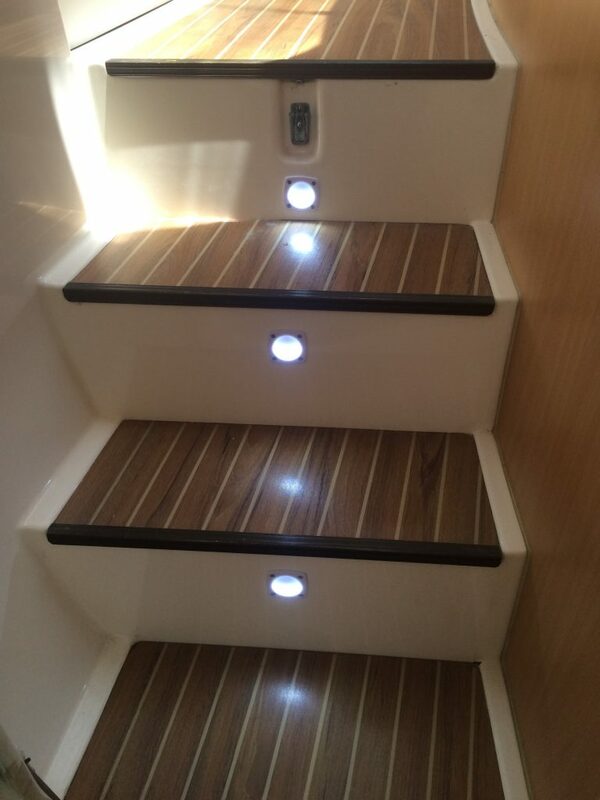 We are far from finished, but at least we feel it is now safe, clean enough and the electric push-button toilets are functioning properly so that we can have guests aboard now. 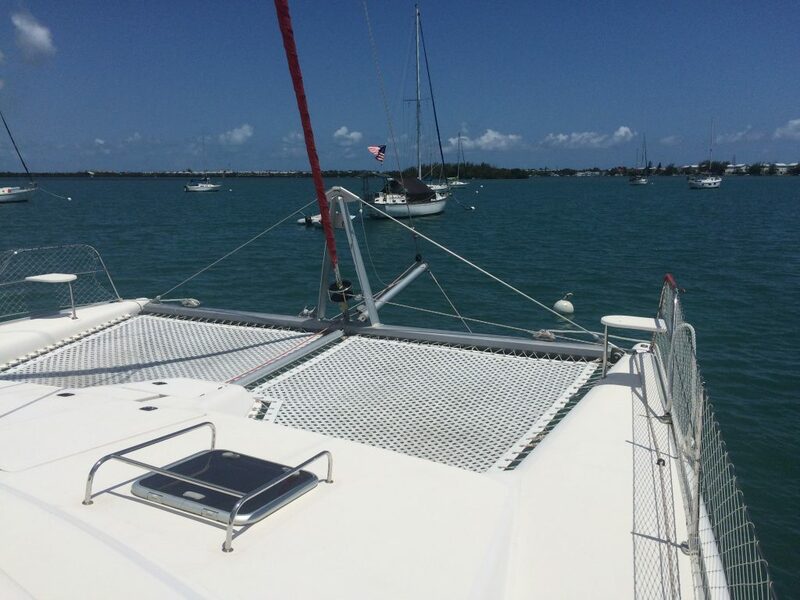 Lindsay and I both still have many things on the list, and the boat is far from ready to cross the Atlantic ocean, let alone leave Florida and cruise up the East Coast. Luckily, we have time to get ready. 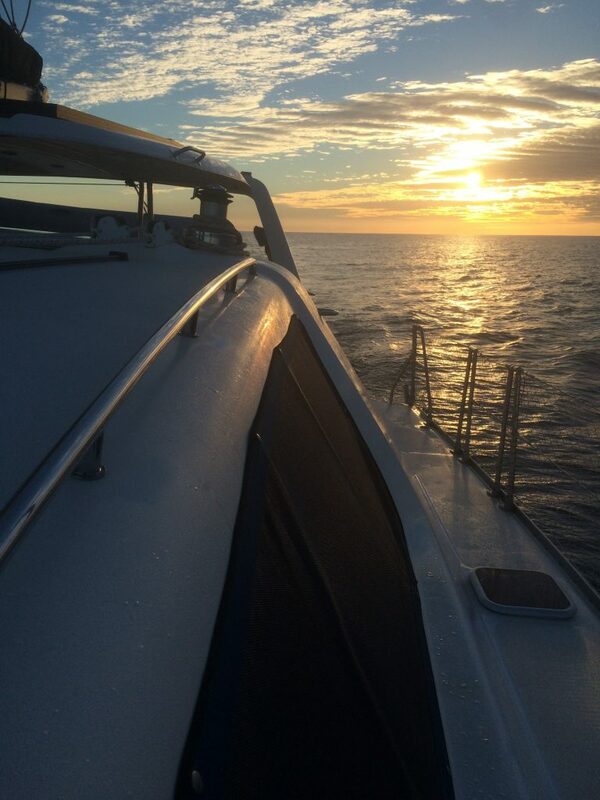 We do occasionally head out for sunset sailing with friends. The three air conditioning units are working just fine! 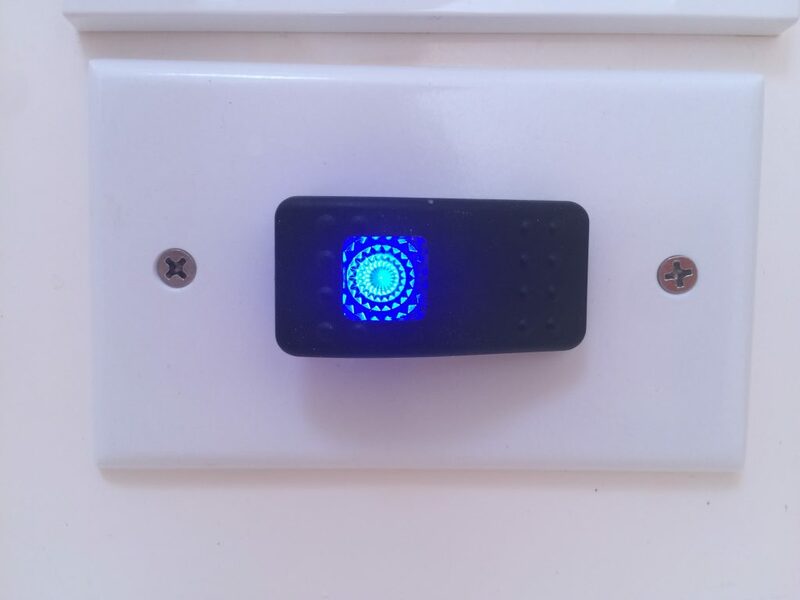 New courtesy lights on every step. 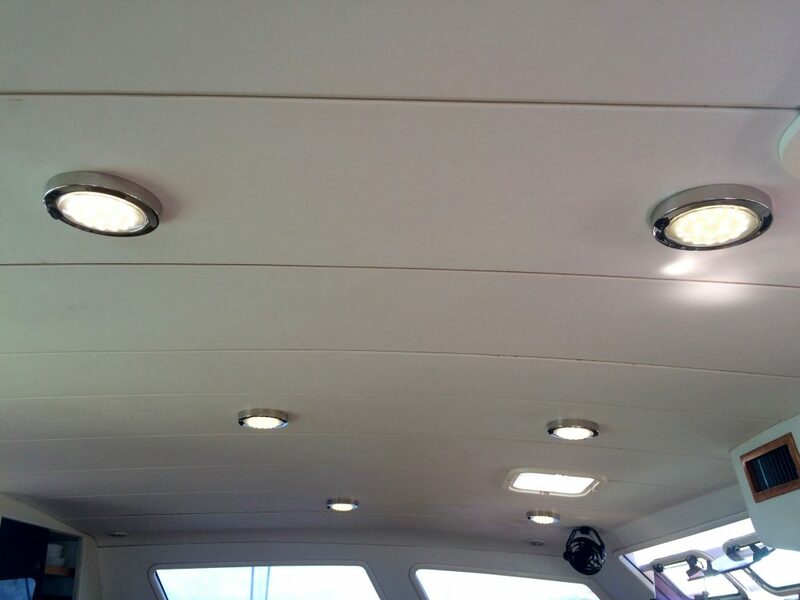 All new LED lights in the salon and galley. 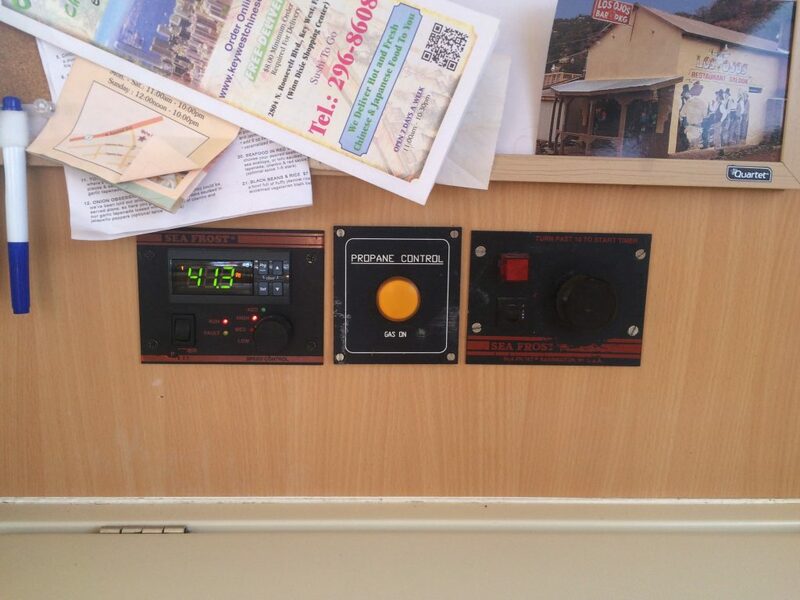 Can be switched to red for navigating at night and making more coffee and tea! 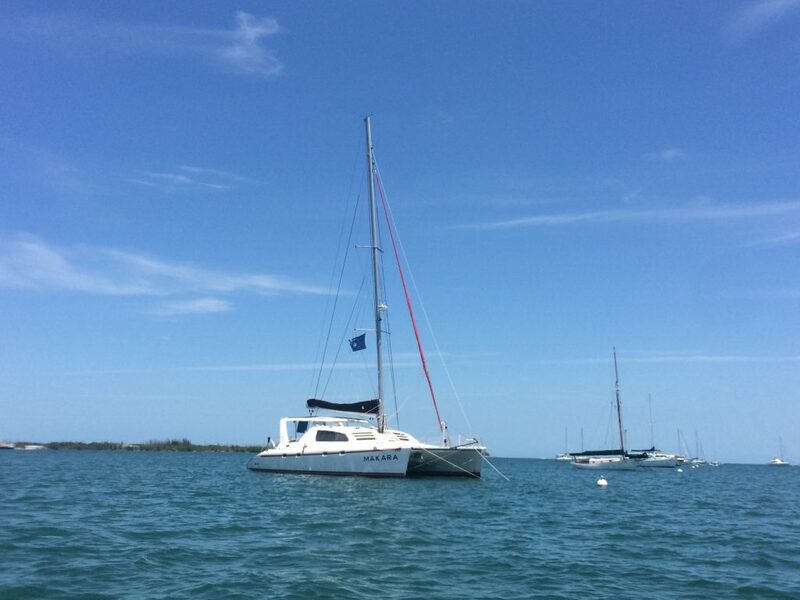 We still have not used the bowsprit and the asymmetrical spinnaker yet. 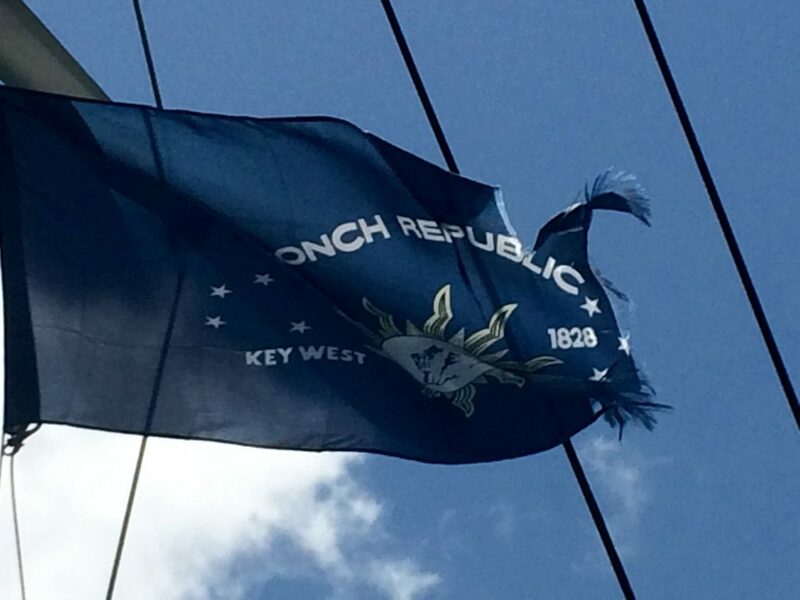 Flying the courtesy flag of the Conch Republic, with signs of wear. I think it’s still legal. 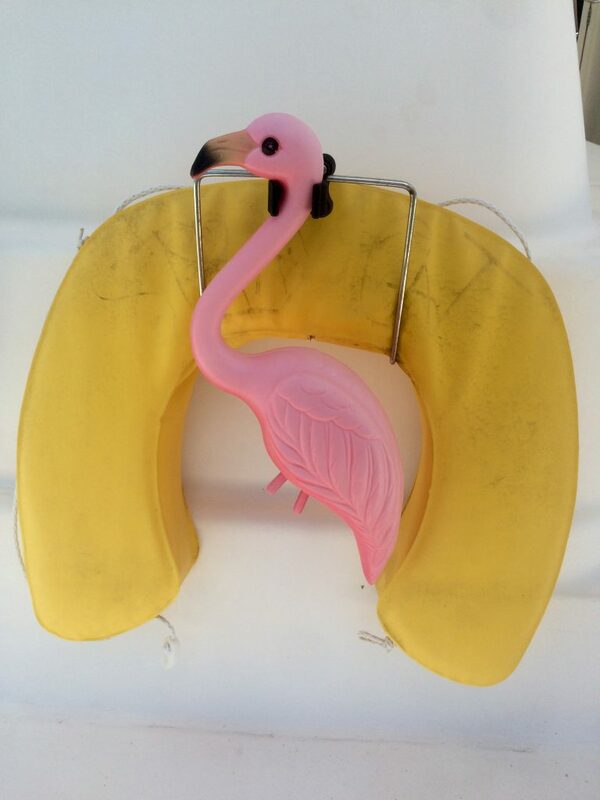 I rescued Tom and Linda Erb’s flamingo from their trash can. Very Keysee. 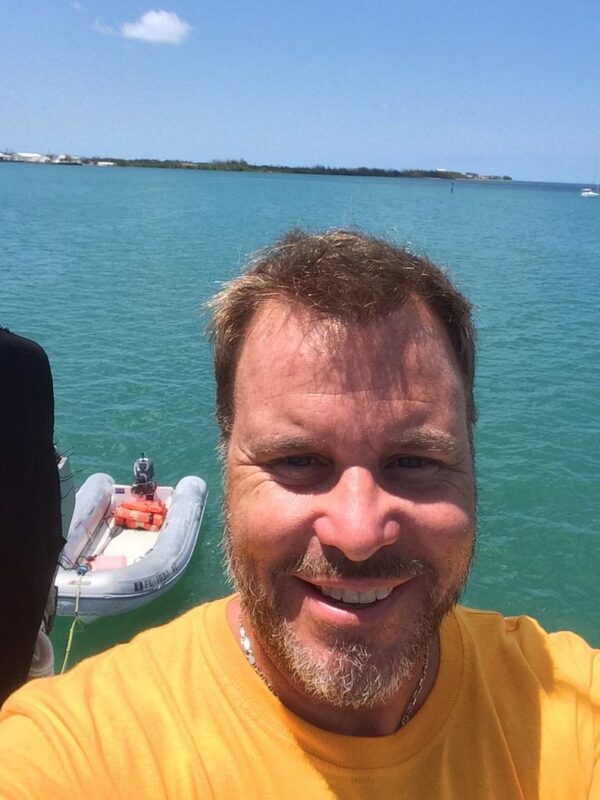 That’s Fleming Key behind me, an obstacle to the west, and to the Atlantic.